Gran's Remedy is New Zealand's No. 1 remedy for smelly feet and footwear. Gran's Remedy is a unique blend of powders that treats the problem of smelly feet or foot odour, the only product that treats the foot and shoe simultaneously. Sprinkle one teaspoon of powder into the shoe each day for seven days and Gran's Remedy leaves your feet, shoes and socks odour-free for up to six months. 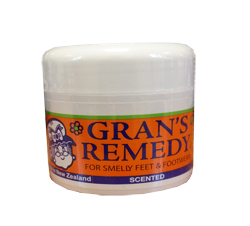 Clinical tests undertaken by the University of Otago show that Gran's Remedy is the only product on the market which is 100% effective in eliminating all 5 of the bacteria which are responsible for causing feet and shoes to smell. I've been using Grans Remedy for years, there is no other product that works as well. Just wish it was easier to get in U.K.